Have you ever felt that your ears were blocked so that you couldn't hear? Have you ever had popping or clicking in your ears or have had trouble keeping your balance? These are just some of the symptoms associated with auditory tube dysfunction (also known as eustachian tube dysfunction). It can be caused by any number of conditions but is most associated with either an accumulation of mucus or an imbalance of air pressure in the middle ear. It opens and closes in response to changes in ambient air pressure in order to equalize pressure in the middle ear. It may close in response to loud noises to protect delicate ear structures. It clears mucus from the middle ear, allowing it to drain into the back of the throat. The auditory tube in children runs at a more horizontal angle than in adults. With age, the tube enlarges and gradually becomes more vertical to facilitate better drainage. This explains why children are more prone to auditory tube problems. While the auditory tube is normally closed, it does open periodically such as when we swallow, yawn, or sneeze. This explains why we often need to swallow in order to "pop" our ears when driving up a mountain or taking off in an airplane. When you swallow, your auditory tube opens and equalizes the pressure in automatically. Broadly speaking, auditory tube dysfunction occurs when the eustachian tube either fails to equalize air pressure or is unable to clear mucus from the middle ear. If air pressure changes rapidly, it can cause discomfort, pain, and even a ruptured eardrum. If mucus is not properly cleared, it can lead to middle ear infections (otitis media), fluid in the ear (serous otitis media), or hearing loss caused by changes in the position of the eardrum (middle ear atelectasis). These conditions can result in pain, hearing loss, dizziness, and even ear damage. There are several methods for diagnosing the causes of auditory tube dysfunction. An ENT doctor, as known as an otolaryngologist, is a specialist qualified to diagnose these types of conditions. A visual tool called otoscope will be used to look at your eardrum (tympanic membrane). Changes in the appearance or mobility can often indicate fluid in the ear. A ruptured ear drum can also be visually diagnosed. A fiber optic endoscope may be used, the instrument of which is inserted through the nose to see if any enlarged tissues are blocking the auditory tube. A tympanometry is another specialized instrument that can measure the air pressure in the middle ear, with a high pressure reading indicating auditory tube dysfunction. The tests are pretty straightforward and cause no more discomfort than having your temperature taken in the ear. If there are any serious concerns, imaging tests such as computerized tomography (CT scans) or magnetic resonance Image (MRI) may be ordered to look for tissues or masses that may be blocking the tube. If your doctor believes that the dysfunction is caused by allergy, an allergist or may be sought for further investigation. 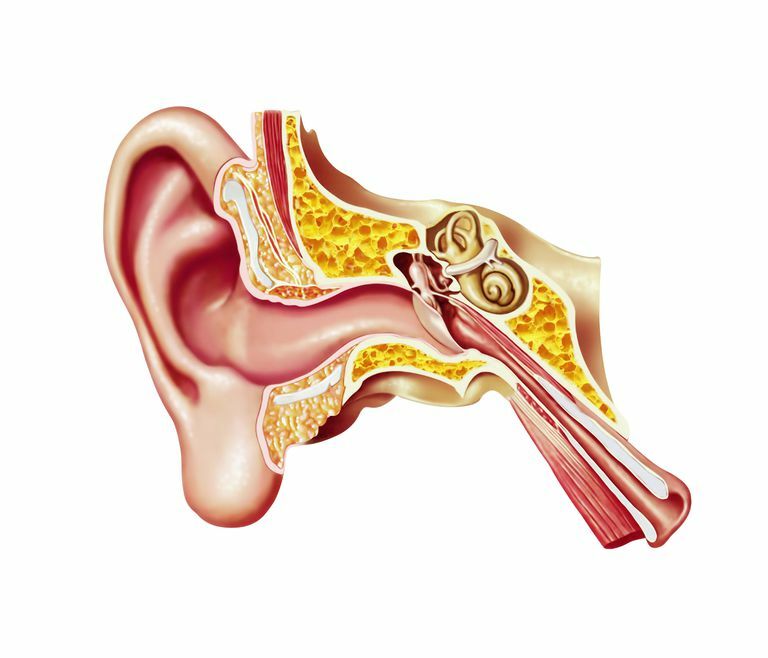 Treatment for auditory tube dysfunction varies and is based largely on the root cause of the problem. In the case of fluid in the ear, many individuals are able to clear the fluid on their own over time. If the fluid is still present after three to six months, a doctor may choose to drain the excess fluid using ventilation tubes. If enlarged tissue (such as an adenoid, polyp, turbinate, or tumor) is seen to be the cause, they can be removed using a procedure called endoscopic sinus surgery. It is important to treat any underlying conditions, including allergies, infections, or growths, that may be causing or contributing to the problem. Prevention is always better than treatment, and, in the case of auditory tube dysfunction, the tools for prevention couldn’t be simpler. To prevent pain or damage caused by rapid changes in air pressure, swallow or yawn regularly when taking off in an airplane or driving up a steep mountain. If you scuba dive, descend slowly to allow the pressure to equalize gradually. In some cases, it can help to take a decongestant, such as pseudoephedrine, just before flying or diving. You should also have any underlying allergies or sinus problems treated to prevent barotrauma. If you do experience air-pressure related ear trauma, give it time to heal. A ruptured ear drum will usually get better by itself in a few days. In more severe cases, surgery may be needed, but this is more the exception than the rule. Schilder, A.; Bhutta, M.; Butler, C.; et al. “Eustachian tube dysfunction: consensus statement on definition, types, clinical presentation, and diagnosis.” Clinical Otolaryngology. October 2015; 40(5):407-411.